April 5, 2019 It looks like that Division 2 easter egg was indeed an Assassin’s Creed Vikings teaser. A recently-discovered easter egg in The Division 2 seemed to suggest that the next Assassin’s Creed will have a Nordic theme. Now, a fresh insider report has confirmed exactly that. An Assassin’s Creed game, currently code-named Kingdom, is expected to launch to launch in 2020, and will indeed be about Vikings. The Kotaku report also makes mention of a London setting for Watch Dogs 3, a long-rumoured thing that could very easily slot in as Ubisoft’s big game release for 2019. We’ll likely find out more at Ubisoft’s E3 press conference this year, along with whatever other surprises the publisher has in store. If you missed the Division 2 teaser, a forum post on the Assassin’s Creed fandom site shows a character looking at a post of a cloaked man wearing a helmet and some sort of tunic. In his left hand, he’s holding some kind of staff or spear, and in another, a mysterious sphere. The legible text on the poster points to the JFK Center, and the word above it reads ‘Valhalla’, referencing the Viking afterlife. Assassin’s Creed YouTuber JorRaptor points toward an extra detail. Zooming in on that mystery sphere shows off something that looks an awful lot like an Apple of Eden, a type of mythological artifact important to the stories of multiple Assassin’s Creed games. Last year, former Ubisoft concept artist Michel Nucera posted images of something they referred to as Assassin’s Creed Ragnarok. Nucera, who now works at Everybody’s Gone to the Rapture developer The Chinese Room, said at the time that the artwork represented a personal project, and that they weren’t attached to development of the Assassin’s Creed franchise, but they have since taken the images down from their ArtStation account. 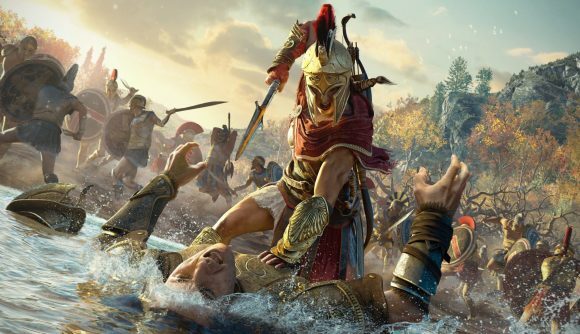 Multiple contradictory rumours have done the rounds concerning the next Assassin’s Creed game since the release of Odyssey last year. An Assassin’s Creed 3 cinematic could point towards a Japanese setting, while other rumours suggest the series will be returning to Rome. An AC game named ‘Legion’, reportedly due out in 2020, had been hinted at, but all indications are that those rumours are incorrect.